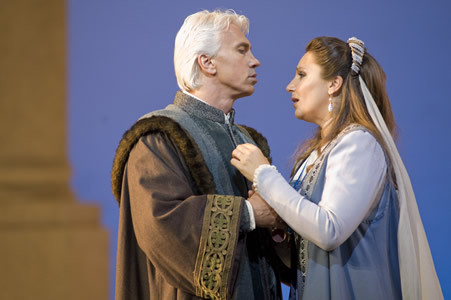 “Simon Boccanegra” got a bad rap from the very beginning. The first version, which premiered in 1857, received a lukewarm reception around Italian opera houses and was roundly rejected at La Scala, leading to its withdrawal and extensive reworking (including a new librettist) before reappearing almost 25 years later. Even then it never achieved the popularity of the composer’s other mature operas and, in our own time (with the exception of the day of the late Lawrence Tibbet who made the role his own), has rarely been revived except to showcase an important baritone and/or spectacular sets. San Francisco Opera has both in its current production, starring Russian superstar Dmitri Hvorostovsky and with a stunner of a set by Michael Yeargan that depends on soaring white pillars that burn umber with the rising sun and turn dark and menacing as night falls. But it has even more. With a truly fine cast and Donald Runnicles in the pit, it reveals some of the loveliest music Verdi ever penned. The heroine Amelia’s aria telling of her early days as an orphan is as heartbreaking as anything in “La Traviata” and the ensuing duet with her father, Simon, the Doge of Genoa, as lyrical as those in “Rigoletto.” A dramatic sextet between the heroes and villains ends Act One and Act Two includes a beautiful trio of reconciliation, plus a lot more. To repeat, “Simon Boccanegra” gets a bad rap. This is music worth hearing again and again. Granted, the plot is more than a little complicated. Basically it’s a tale of Italian vendetta with a capital V. And political enough to fly in this election-minded climate. Simon, a buccaneer who has freed Genoa’s sea from Venetian pirates, is elected head of state. He is a plebian, a commoner, and has an ongoing feud with the haughty patrician Fiesco, the father of the girl he loves. The girl dies at the opening of the opera, the daughter she has borne Simon is lost and the whole thing resumes 25 years later as the girl, Amelia, turns out to be living (unbeknownst) with her grandfather and preparing to wed her father’s arch enemy. There is much recognition and reconciliation, betrayal by underlings, a kidnapping and an assassination before it all plays out. Fortunately, the supertitles make it all reasonably clear. Hvorostovsky is a commanding Simon, starting out in his pirate garb and a brown wig and coming back, 25 years later, with his own glorious mane of white hair to show us the now-just ruler and adoring father. Barbara Frittoli is a lovely Amelia, her clear soprano soaring above the others in the ensembles. Vitalij Kowaljow delivers a fine Fiesco and Patrick Carfizzi is the villainous courtier Paolo. But the big surprise is Texas-born tenor Marcus Haddock, who sings Gabriele Adorno, the revolutionary who Amelia loves. Haddock sang the king in San Francisco’s “Ballo in Maschera” two seasons ago and this is a welcome return. A really good tenor is hard to find and he is really good. Runnicles had things firmly in his capable hands orchestrally and Ian Robertson’s chorus, not used here as much as in other Verdi grand operas like “Aida,” “Otello” or “Don Carlo,” did well with the music it had. The sumptuous costumes were by Peter J. Hall and Christopher Maravich did the dramatic lighting design. As far as I can make out, San Francisco has only done “Simon Boccanegra” five times since it first premiered on the War Memorial Opera House stage in 1941 with the inimitable Tibbett in the title role. You might want to catch it while you can.